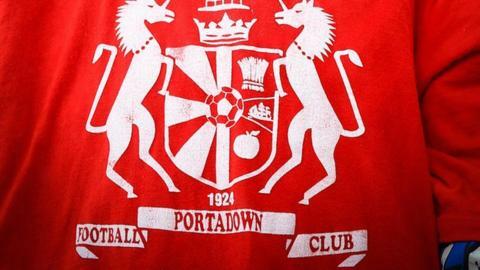 Premiership club Portadown have been fined £10,000 after being found guilty of committing two offences in relation to undisclosed payments to players. The Irish FA's Disciplinary Committee ruled that £5,000 should be payable within 14 days and £5,000 suspended until 1 June 2017. The Ports have been banned from signing any new players on a new professional contract until the same date. The Shamrock Park outfit were represented at the hearing by a club official and a legal representative and are understood to be considering an appeal. "The Board of Portadown FC are actively considering an appeal against the decision. A further statement will be issued in the coming days," read a statement on the Portadown FC website. McFall was unable to add to his squad prior to this season, following the club's defeat by Glentoran in the 2015 Irish Cup final, the only goal of the game coming after a controversial refereeing decision. Midfielder Michael Gault has signed a pre-contract agreement to play for league champions Crusaders next season and defender Chris Ramsey has done likewise with Cliftonville. Striker Gary Twigg had agreed a deal to join Ballymena United, but has since had a change of heart. A number of other players are coming out of contract at the end of the current campaign.